The main gallery space of the D'aguilar Foundation featuring a collection of works by prominent Bahamian artists. A burgeoning trend in the MICE industry is to find and curate unconventional spaces for meetings, incentives, conferences and events. Traditional restaurants and meeting rooms are being cast aside for unique, soulful, "living" spaces that are more likely to spur original group conversation, creative thought and perhaps that killer idea that everyone is waiting for. 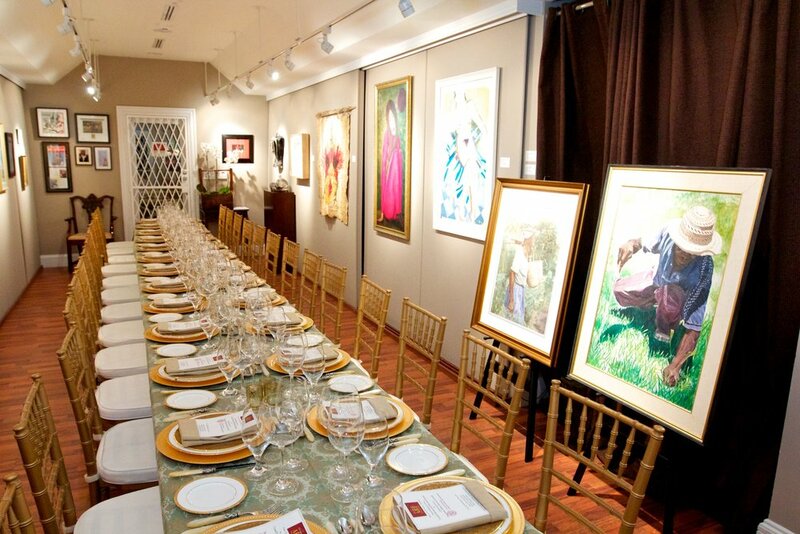 That said, when a prestigious client requested a bespoke space for a business dinner, Nassau's D'Aguilar Art Foundation seemed the perfect choice. Set in a quaint colonial-style cottage on downtown Nassau's Virginia Street, the intimate art gallery (specialising in showcasing avant-garde Bahamian art) is the perfect catalyst for inspiring dinner conversation. In respect to event design, it was important for us to "strip back" a little on the décor, selecting a modest palette and gilded table settings, to draw the eye up from the table and let the art-covered walls do the talking for themselves!